After a two-year long process in discussing various protest movements and struggles for socio-economic justice in Southeast Europe, the decision was taken to establish the #DemLeftSEE into a transnational organization that would pick up the process initiated in Tuzla in 2016. The initiative was first made public in November 2017 with a large event organized by the FES Dialogue SOE and its partners in Sarajevo with the attendance of Macedonian Prime Minister Zoran Zaev. Now it has been decided that the initiative should take a more substantial form and establish itself into a self-sustaining and functioning transnational organization based in Southeast Europe. Over the course of two days, participants discussed possibilities of creating this organization, whilst formulating its overarching goals. The three main pillars of the organization are comprised of: community empowerment, outreach and advocacy. 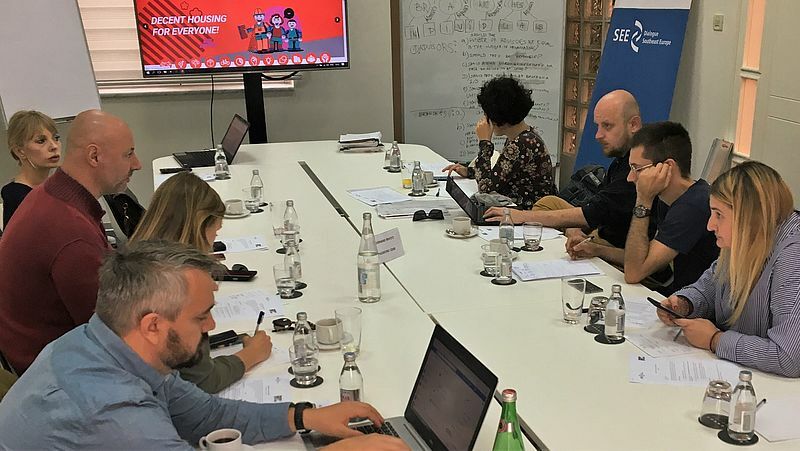 Participants of the workshop agreed on the upcoming steps necessary to establish the organization in the region and decided that the hub of the organization should be based in Belgrade, Serbia, due to its accessibility. A governance structure built from the bottom-up was decided upon, with a general assembly consisting of organizations and individuals that were involved in the process so far. Further steps to be taken for the initiative are its registration which will happen by the end of 2018 and the first general assembly to be called in the spring of 2019. Further updates on the process will be published at www.dl.community as well as here.